The submarine attaches with a cable to a small transmitter. 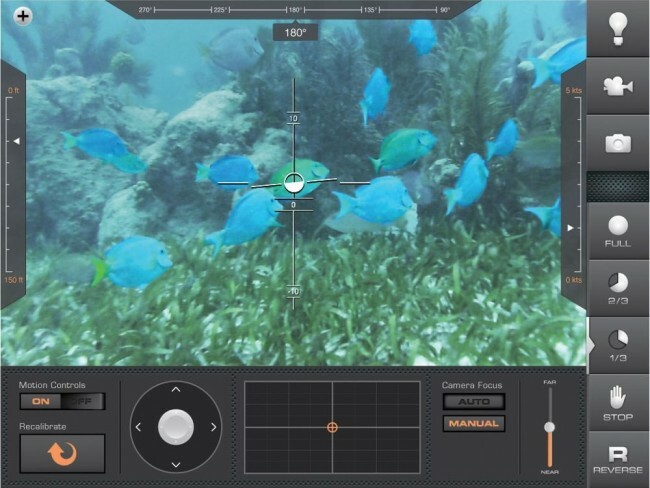 This transmitter connects wirelessly to an iPad and an app on the iPad can be used to view the stream from the camera as well as control the craft in the water. The submarine moves with electric thrust and lift propellors which provide forward/backward, left/right and up/down movement at up to 5kts moving forward and 1kt in reverse. The camera inside is capable of streaming video at HD 720p (1280 x 720 pixels). It can capture slightly larger still images at 1280 x 800 pixels. To help with lighting the subjects of the camera, an array of 8 LEDs are added. These have adjustable intensity allowing you more easily to get a better shot depending on the circumstances and lighting available from above. A 32GB memory card is used to capture video. If images are captured, they are stored directly on the iPad. As for pricing, you’ll cry if you want this as a toy because it is currently $6,300 at Hammacher as it is mainly designed for professionals who would make good use of such a snazzy device.